The Clarets will break in to the Premier League's top six should they complete the double over dethroned champions Chelsea and midfielder Jack Cork feels that would be a glowing marker of the club's achievements this term. The 28-year-old, who spent the developmental part of his career with the Blues at Stamford Bridge, going out on loan to six different clubs during his stay, is determined to make it six wins in succession with victory over his former employers. 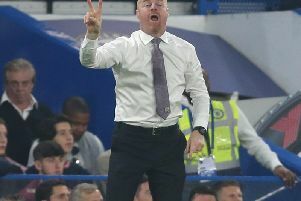 Chelsea are the only so-called 'big six' side that the Clarets have taken maximum points off this term and a repeat would see Burnley become only the second club in the top flight to win both fixtures against Antonio Conte's men, adding to Manchester City's success. Cork said: "It would be a massive achievement to follow up what we did at Stamford Bridge with another win against them. "Chelsea are the only team in the top six that we've beaten so far so it would be great to follow that up. "If we did that it would be something that we wouldn't have expected to be doing. To be pushing up towards fifth would be a greater marker of what we've all achieved. "I think any pro would say they'd want to win against their old clubs. It doesn't necessarily mean that they dislike that club, it's just nice to go there sometimes and try to prove a point and get a result." Burnley have had to re-evaluate their targets on a number of occasions this season and Cork, who has netted against Swansea City and Watford this season, both with his head, can't believe how far the club has come. With survival the key ambition at the start of the season, he said: "You just want to finish outside the bottom three with 40 points, that's what you set your target as every year in the Premier League. "It would be a bit arrogant not to because it's a tough league which is constantly changing with teams and managers and money. "It's difficult and every year it gets harder and harder to predict. For us to finish so much higher than we'd predicted is great. "It's not impossible but it would be hard to build on a season as good as this. I've been in teams before that have had great seasons, got carried away and then it just hasn't worked. "For us to have a good start and get to 40 points will always be the marker at the start of every season. "Over the last five games our targets have kept changing after reaching the 40-point mark. It would be nice to see the final five games through, play as well as we can and enjoy it."